Launched in 1976 in a Hungry Tiger restaurant in Thousand Oaks, California, the Calvary Community Church moved into its 235,000-square-foot building on a 17-acre site in nearby Westlake Village in 1999 and have kept on growing ever since, now seeing an attendance of about 3,500 people each Sunday. One of the hallmarks of the church’s success has been careful management of capital costs, something that extends to its AV systems infrastructure. And just as the journey of a thousand miles begins with the first step, the road to replacing major sound and video platforms at the church began with the decision to replace its aging FOH console last year. For that, they enlisted the aid of Guitar Center Professional (GC Pro), the business-to-business (B2B) division of Guitar Center providing highly customized service for professional accounts, which was brought into the decision process at a point when the church leaders thought they had already come to a final decision. Instead, Penninger recommended an Avid® VENUE | S6L, a modular system with onboard industry-standard plug-ins and Pro Tools integration. “We arranged for Avid to come out and put on a special semi-private demo — one of the first in Southern California for this console,” says Penninger. 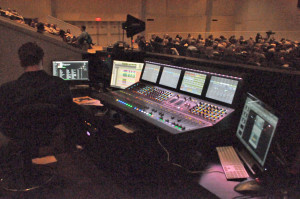 “The church leaders were all very impressed.” He pointed out how this console allowed them to have 64 channels of Pro Tools recording and playback and put it all on a single strand of AVB-networked Ethernet cable. “The console is also very user-friendly to operate, which is important to a church that often brings in outside acts with their own FOH engineers to run sound,” he says.